What is the claims section? Which items go into claims? How do I access the claims section? How do I claim items? You might have noticed a little blinking text under your character's ego saying "claimable items" and have asked yourself: Where do I claim these items now? This little text appears as soon as you have some sort of overflow in your inventory. It is practically a temporary storage for all kinds of items. The claims section is cross-character, this means, any character you make will have access to the same claim section. There are items bound to a specific character though. There is a bunch of stuff that can go into claims. You also have to distinguish between store bought items, items you acquire in-game and promotional things you can get. All of these items will go into your claim section as soon as either your inventory is full or the stack of the consumables you carry is full. Consumables will only go into claims when they drop from any lock box, those you pick up from the ground will be automatically salvaged. Items in the claim section can also be from promotional things, as Arkfall Codes (expired), certain editions of the game and DLCs. Those items are bound to a specific character and will not appear in the claim section of another character. You can claim them only once per character. 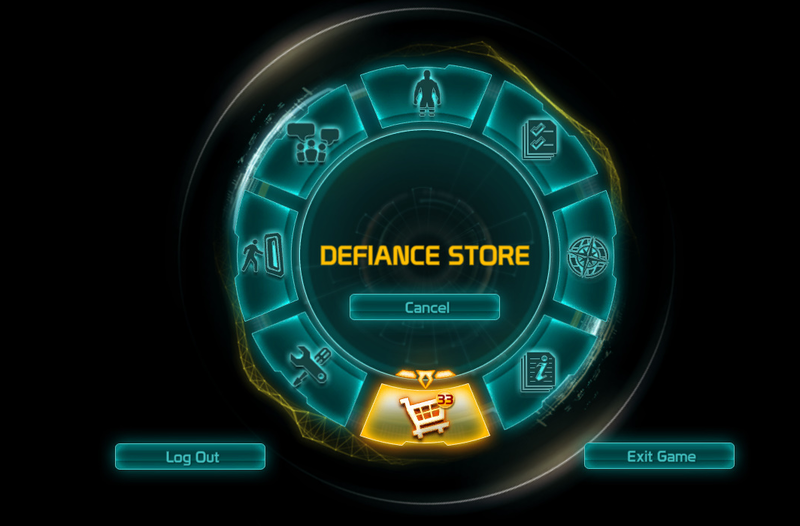 To access claims, bring up the radial menu and select the Defiance Store. You'll notice a number above the shopping cart. 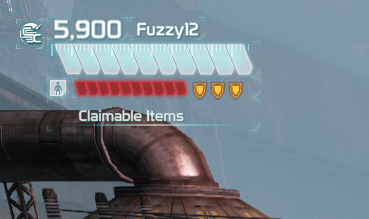 That's the number of items currently in your claim section. After you selected the Defiance store, you are in the Bitshop. Select the hand-like symbol with the number above it at the top of your screen again and you will land in your claim section. Having accessed your claim section, you may notice a timer on some of the items in your claim section. That timer is set to 7 days and starts as soon as you receive an item going into claims. After those 7 days, items will get automatically salvaged. Items like outfits, titles, inventory space or boosts aren't affected by this as seen below. 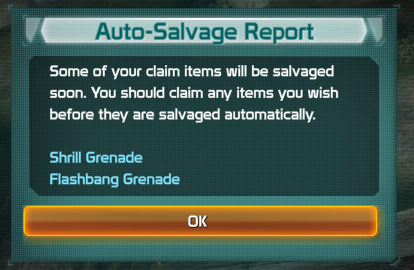 So you don't have to check your claim section daily if some of your items might get salvaged soon, you get an auto-salvage report upon logging in or changing shards, telling you exactly which items will get salvaged soon. This report starts two to three days before the items get actually salvaged. To claim an item, simply select the item you wish to claim and select "Claim Item" at the bottom of the screen. You could also break them down into salvage before the timer runs out if you wish to do that.